Invest in your team - Get 30 x Red Hat Online Classes for £3,480!!! It just got a lot easier to train yourself or your team, improve technical skills, and get back to what matters: keeping your business up and running. 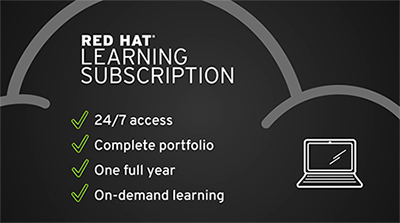 Red Hat Learning Subscription offers all of our Authorised Red Hat Online Learning courses in a single package. There are over 30 x Red Hat Online Course titles to choose from. If you have any questions, or if you would like to register for a course, please call us directly at 0845 470 1000 or email enquiries@flane.co.uk.